A vehicle with placards for both Lyft and Uber waited at a traffic light outside South Station. Boston accounted for more than half of the 65 million rides Uber and Lyft provided across all of Massachusetts last year, a new report said. It’s not your imagination: There are an awful lot of Uber and Lyft cars in Boston traffic. The ride-hailing companies provided nearly 35 million trips in Boston in 2017, or an average of about 96,000 every day, according to data released by Massachusetts officials Tuesday. Boston accounted for more than half of the 65 million rides Uber and Lyft provided across all of Massachusetts last year, according to data the Department of Public Utilities collected from the ride-hailing companies under a new state law regulating the industry. Every minute in the city there were, on average, 67 Uber and Lyft rides underway. These are the first hard numbers to document the explosive growth of the services, which set up shop in Massachusetts only a few short years ago. Even before ride-hailing really caught hold, taxi companies in Boston had about 11.4 million trips in 2013 — about a third of the traffic Lyft and Uber now command. Now decimated by their competitors, taxis completed just 5.9 million trips last year, according to the Boston Police Department. The new data also show that Uber and Lyft, practically overnight, have become a significant portion of the traffic that courses through Boston roads. City data estimate that every morning rush hour more than 160,000 vehicles enter, leave, or drive within Boston. Boston officials did not return requests for comment. There’s also a growing concern among planners that Uber and Lyft are siphoning customers from the Massachusetts Bay Transportation Authority, undermining support for public transit, while adding vehicles to the region’s already congested roads. Massachusetts transportation officials declined to comment Tuesday. But at an event last week, Transportation Secretary Stephanie Pollack said ride-hailing services were likely diminishing transit ridership across the state, including in cities such as Worcester and Springfield. “It’s not just Boston and Cambridge,” she said. A February report from the Metropolitan Area Planning Council, a regional agency, found that more than 40 percent of ride-hailing passengers would have otherwise used public transit, meaning they were drawn off trains and buses and into cars. MAPC executive director Marc Draisen said the new state data indicate about 3.8 percent of all forms of travel in Boston happen in ride-hailing cars. While somewhat “modest,” he said, that figure is notable for how quickly the companies have grabbed that chunk of the market. The new law requires Lyft and Uber to pay a 20 cent fee for each ride, with half going to municipality where the ride originated and the other 10 cents split between the state and a special fund to help the taxi industry. Under that formula, Boston will receive about $3.5 million from the companies for 2017; meanwhile the small Western Massachusetts town of Alford, which had one ride, will get a dime. Overall, the fee generated nearly $13 million in 2017. Draisen said the 20 cent fee is too low, and pointed to other cities considering higher fees to fund public transit, such as Chicago, where the fee is 67 cents per ride. 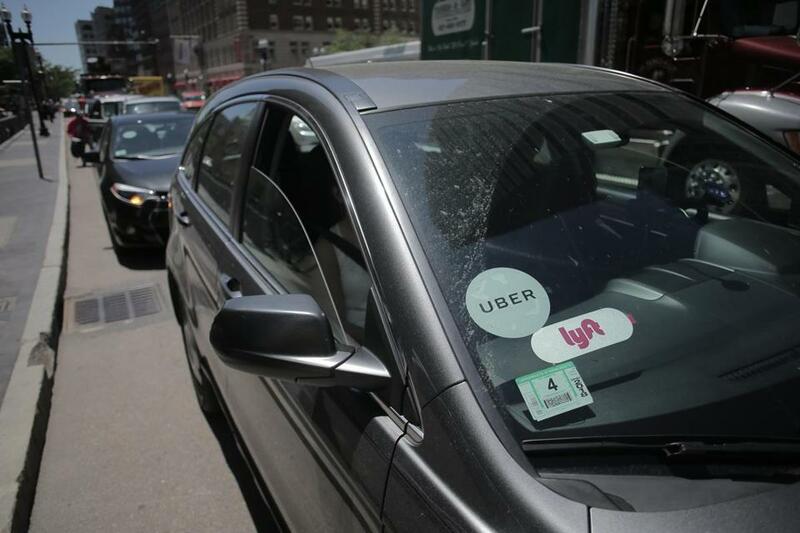 The Massachusetts transit system, he said, loses far more revenue from competition from ride-hailing than it could hope to benefit from the fee Uber and Lyft pay to the state. The state combined data received from all ride-hailing companies, so it’s unclear how much of the market each company has. Uber spokeswoman Alix Anfang said the company “helps fill gaps in communities that lack convenient access to the T, helping people affordably and reliably move around the city.” And Lyft spokeswoman Campbell Matthews argued that the company’s carpool service for multiple riders helps offset the impact of congestion. Meanwhile, some transportation advocates say the data aren’t all that helpful to city and regional planners because it is not geographically specific enough. It does not, for example, show what routes drivers take, which would inform transportation planners, but instead just municipalities where trips began and ended. Even neighborhood-to-neighborhood data previously collected by Boston were ultimately dismissed by city officials as too vague to be useful. Not surprisingly, the vast majority of the rides the companies provided in 2017 were in the urban ring in and around Boston. The second highest number of Uber and Lyft rides was in Cambridge, with about 6.8 million; meanwhile Somerville and Brookline each had more than 2 million, and more than 1 million originated in Newton. More than 80 percent of all rides in Massachusetts started in Suffolk or Middlesex counties. Other big knots of usage were in Worcester, with about 850,000 rides, and Springfield, with more than 375,000. The average ride-hailing trip in Massachusetts lasts about 15 minutes and travels about 17 miles an hour, according to the state data. That’s heavily influenced by the clustering of trips in Boston, where the average ride-hailing trip travels at 16 miles an hour.